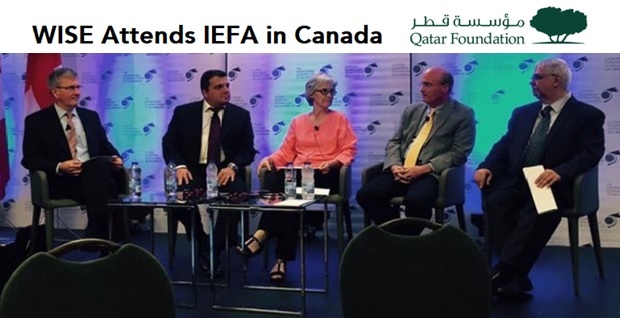 The participants at a roundtable of the International Economic Forum of the Americas held in Montreal on June 15, 2016, as identified by the Qatar Foundation / Archive.Today and the Qatari newspaper Gulf Times / Archive.Today. From left to right: Alan Shepard, Board member of the Center for the Prevention of Radicalization Leading to Violence (CPRLV) and President of Concordia University, Stavros Yiannouka, CEO of WISE, a Qatar Foundation organization, Cecilia D’Oliveira, Associate Dean at the MIT, Mike Feerick, founder of the Alison courses and Robert Beauchemin, CEO of KnowledgeOne. The Qatar Foundation / Archive.Today and the Qatari newspaper Gulf Times / Archive.Today reported that, on June 15, 2016, during the International Economic Forum of the Americas held in Montreal, Alan Shepard, a member of the Center for the Prevention of Radicalization Leading to Violence’s Board, moderated a roundtable featuring Stavros Yiannouka, the CEO of WISE, a Qatar Foundation organization. The Qatari organization WISE also took part to the International Economic Forum of the Americas in Montreal in 2015 and 2017. The Center for the Prevention of Radicalization Leading to Violence is funded by the City of Montreal and the Government of Quebec. It was established in November 2015 in response to terrorist attacks led by Islamists in Saint-Jean-sur-Richelieu and Ottawa one year earlier. On May 25, 2016, the Montreal Police Service announced its ‘partnership’ and a ‘cooperation agreement’ with the CPRLV. This is the third unjustifiable meeting between publicly funded CPRLV leaders and Islamist lobbies that has been documented by Point de Bascule in recent weeks. CPRLV leaders have also met dignitaries of foreign governments. They have been invited / WebArchive by the U.S. Consulate General in Montreal on, at least, two occasions in 2016. 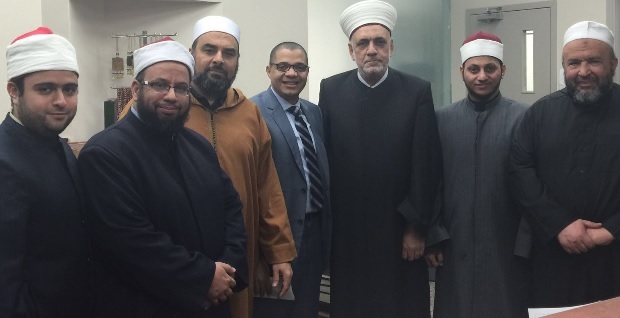 JANUARY 5, 2016 – CPRLV Director Herman Deparice-Okomba met the Quebec Council of Imams. Imams Ahmed Kandil, Hussein Amer and Said Fawaz were among the Council’s representatives at the meeting. The first of these men justifies killing Muslims who abandon Islam, the second works for the Muslim Association of Canada, an organization that endorses Syed Maududi who advocates the overthrow of all non-Muslim governments, and the third one represents a Saudi organization that has promoted armed jihad on numerous occasions. APRIL 7, 2016 – CPRLV Programs Coordinator Marian Misdrahi was invited / WebArchive for an informal discussion over coffee at the U.S. Consul General Nina Maria Fite’s residence in Montreal. Ms. Misdrahi reported / WebArchive on her participation in the Strong Cities program held in March 2016 throughout the U.S. (“Strong Cities – Building Community Resilience to Radicalization and Violent Extremism”). The participants from ten countries, including Turkey, Morocco and Tunisia, travelled in five American cities to meet with state, city, and local leaders. U.S. Secretary of State John Kerry hosted the launch of the program in Washington on March 1, 2016. JUNE 15, 2016 – CPRLV Board member Alan Shepard moderated a roundtable featuring Stavros Yiannouka, the CEO of WISE, a Qatar Foundation organization. The Qatar Foundation was founded by the Emir of Qatar and his second wife in 1995. The foundation financially supports Islamists such as the Muslim Brotherhood’s spiritual guide, Youssef Qaradawi, who justified suicide operations, the murder of Muslims who abandon Islam and other acts of violence that conform to sharia law. Qatar is recognized as a sponsor of international terrorism. AUGUST 16, 2016 – CPRLV Research Director Benjamin Ducol was invited by the U.S. Consulate General in Montreal to listen to a report given by Montreal-based Imam Luqman Ahmed and Lamine Foura after they took part in the Anti-Radicalization and CVE among Youth program in several U.S. cities. Luqman Ahmed is an Imam at the Ahmadiyya Islamic Centre in Montreal North and Lamine Foura is the Coordinator of the Quebec Maghreb Congress (Congrès maghrébin au Québec). SEPTEMBER 11, 2016 – CPRLV Director Deparice-Okomba met in Tunisia with leaders of the Center for the Study of Islam and Democracy. This organization is closely linked with Ennahda, the party led by Rachid Ghannouchi whose past terrorist activities have been amply documented by Canada’s Federal Court of Appeal. Look at sections 20 and 21 of the court case in particular. Since its establishment, the CPRLV seems to have lost interest in the Islamist threat and has focused on what it calls the “far-right” in which the Center seems to include all those who are concerned about the Islamist threat. Nowhere in the CPRLV’s publications can we find a clear statement to the effect that opposing the Islamist threat is legitimate, as was the opposition to other forms of totalitarianism in the past. According to the description provided by the CPRLV on its website, Muslims who have been radicalized and who contemplate joining violent groups in Canada or abroad are reacting to criticism expressed about their religion. They are taking “the defence, by violent means, of a religious identity perceived to be under attack” / WebArchive, the CPRLV contends. This leads the CPRLV and others who share this thesis to consider that by silencing those who criticize Islam (the so-called ‘Islamophobic far-right’), the anger of Muslims will be defused and their ‘radicalization’ prevented. On June 10, 2015, Quebec’s Premier Couillard defended the same thesis when he introduced Bill 59 aimed at banning the criticism of Islam. At the time, he insinuated that those who criticize Islam provoke “the fear of others, stereotypes and the rejection of differences” and that they “gave new ammunition” (‘donné des armes nouvelles’) to Islamists. This line of reasoning does not take into account the numerous calls for Islamic conquest that have been propagated by mainstream Islamic scholars for centuries and that are being relayed by local Islamist organizations today. Countries such as Qatar produce educational material for young Muslim children that praises past Islamic conquests in Europe. They support ideologues such as Youssef Qaradawi, who encourage Muslims to wage an Islamic offensive in Europe that he presents as the continuation of the past Islamic military offensives on the continent. In spite of this, publicly funded experts at the CPRLV and elsewhere would like us to believe that it is those recalling these facts who constitute the real threat. While it does not hesitate to designate specific local organizations as being ‘far-right’ and even under ‘fascist’ (sic) influence, the CPRLV is very discreet when it comes to identifying local Islamist organizations engaged in the mobilization / radicalization of young Muslims and the tenets of their doctrine. At best, the CPRLV will mention, on occasions, far-away organizations such as the Islamic State or Al Qaida but it will not tell us who, in Quebec, propagate the thesis of their mentors such as Syed Maududi and Sayyid Qutb. The CPRLV has not only excluded local Islamist organizations and its mentors from its research, it is getting advice from the very Islamist organizations it should be monitoring. CPRLV’s Board member Alan Shepard, who moderated a roundtable featuring the CEO of a Qatar Foundation’s organization, is also President and Vice-Chancellor of Concordia University (Montreal) since 2012. M. Shepard is an American. His profile on the University’s website mentions that he has served as Provost and Vice President of Ryerson University (Toronto) after holding leadership roles at universities in Guelph (Ontario), Texas and Virginia. The closeness between a CPRLV’s administrator and the Qatar Foundation runs directly counter to the Montreal-based Center’s mandate to prevent radicalization leading to violence. The Qatar Foundation financially supports a research center on sharia law of which Youssef Qaradawi is the main scholar and that bears his name. In his 1990 speech that led to his book Priorities of the Islamic movement in the coming phase, Youssef Qaradawi listed a series of “political principles brought to this earth by Islam” in which he included “changing wrong by force whenever possible,” wrong being what does not conform to sharia, of course. The Qatar Foundation has welcomed many other Imams whose hostile comments about non-Muslims should have convinced anybody linked to the CPRLV to keep a distance. In March 2015, the Qatar Foundation announced on Twitter that Saudi Imam Saleh Al-Moghamsy was chosen to lead the prayer for the inauguration of the Qatar Foundation mosque on the Education City campus in Doha (Qatar). Al-Moghamsy maintains / WebArchive that in death, in the eyes of Allah, Al-Qaida founder Osama bin Laden “has more sanctity and honor” than any Jew, Christian, Zoroastrian, atheist, or Islamic apostate simply because he died a Muslim. The Qatar Foundation has also organised several lectures / WebArchive with Muslim scholars Omar Abdelkafi and Aidh al-Qarni. More information about the Qatar Foundation and its preachers is available in a well-researched article published by Politico Magazine on the occasion of Michelle Obama’s visit to Qatar in 2015: Michelle’s Dangerous Journey to Qatar / WebArchive – Archive.Today. The Qatar Foundation also supports another research centre on sharia headed by Tariq Ramadan. In 2012, Ramadan’s organization, Muslim Presence, justified resorting to violence against Charlie Hebdo in an article published on its website. The article remained available on the organization’s website from September 22, 2012 until January 9, 2015, two days after the terrorist attack against Charlie Hebdo. It was withdrawn after Point de Bascule denounced its existence. Other Qatari institutions, such as Qatar Airways, contribute to the Islamist penetration into Western countries by sponsoring universities whose research projects are favorable to the Islamist agenda. Among others, Qatar Airways has sponsored the Montreal-based CERIAS Centre at the University of Quebec (UQAM) with which Paul Eid is associated. In the past, Mr. Eid has accused Point de Bascule of ‘Islamophobia’ and of propagating the ‘fantasy of Islamization.’ Point de Bascule replied to Mr. Eid. Look at the second part of a recent article. The acronym WISE of the Qatar Foundation organization represented by its president in Montreal in 2015, 2016 and 2017 stands for World Innovation Summit for Education. This organization was established by Qatar as a PR agency aimed at Western university administrators. Each year, WISE invites to Doha, the capital of Qatar, university administrators for its annual conference. In 2009, at the first conference, Jacques Frémont, then Provost and Vice-Rector at the University of Montreal, spoke at the event. According to a WISE report, in his 2009 speech, Mr. Frémont advocated the “uselessness of the concept of nation.” The abandonment of the concept of nation directly leads to the elimination of national borders, of course. In the past, Jacques Frémont has also been the director of a program at billionaire George Soros’ Open Society, another organization campaigning for eliminating national borders. After his mandate at the University of Montreal, Mr. Frémont was appointed president of the Quebec Human Rights Commission by a Parti québécois government. During his mandate, Mr. Frémont proposed what would become Bill 59 aimed at facilitating lawsuits against those who criticize Islam. In 2015, Point de Bascule published an article on Jacques Frémont’s participation in the activities of the Qatar Foundation. The endorsement by the Qatar Foundation of ideologues who support terrorism and the Islamic conquest of the West is the continuation of Qatar’s policy of welcoming financiers and promoters of terrorism such as Abd al-Rahman bin Umayr al-Nu’aymi, Wagdi Ghoneim and others.